So you’re remodeling your bathroom and trying to decide what you should do to upgrade it. Some of the problems that you are trying to resolve include adding more storage, making the tight space a little more open and how to give it a fresh, new modern flair. Luckily, modern floating bath vanities serve as a great solution to these problems. The great thing about wall mounted bath vanities is that they come in a variety of styles to best fit your bathroom. Mix and match with brown wooden drawers and porcelain tops, to quartz tops and more. Additionally, each vanity size can be customized to precisely fit in your bathroom without looking like it was too tight a squeeze to put it in. Beyond the customizable style options of the floating vanities, there are also an array of benefits to having a wall mounted vanity over a traditional sink setup. A lot of times when people think of making a space in their home more modern, they often associate this with being expensive. According to HomeAdvisor.com, the average bathroom remodel and upgrade ranges between $5,000 and $12,000 to do things like add space and get new utilities. A wall mount bathroom vanity can completely convert your space for a fraction of the price. All of the floating vanities at Bathroom Place are priced between $400 and $2,000. Regardless of the cost, the vanities convert a traditional space into a modern one instantly. After installation, you’ll find your bathroom more chic and polished looking than ever before. Because the sink is floating above your floor, it gives the perception that the floor extends more than it actually does. This in general makes your entire bathroom appear to be more spacious and less cramped. Additionally, if you can get the vanity color to match the color of your walls, the vanity can look like a natural extension of the wall instead of just a sink. If you feel that your bathroom is too cramped and tight, this slight upgrade will allow you to open up the space without doing any major renovations. Traditional floor mounted vanities look as if they are deceptively spacious storage wise, but that is not always a reality. Oftentimes, the space under your sink is used up by the pipes and plumbing, and this makes it hard to store anything else in there or install shelves. With a floating vanity, you have the opportunity to better use the space above by bringing the stuff you’re storing up to a usable level. It keeps you from having to bend or dig around in a large space under the sink just to find your hair dryer. Many vanities often feature more drawers than a traditional sink would. Whether you’re looking to simply give your bathroom a more modern look or wanting to make the room feel more spacious, a wall mount bathroom vanity is the perfect affordable option. 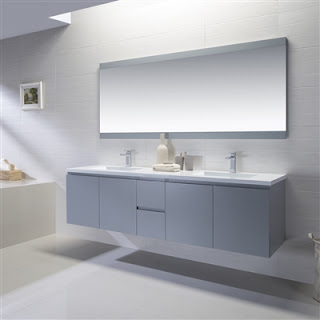 Shop through different styles and colors of floating modern vanities at Bathroom Place!